Upon adding a menu item, WordPress inserts it at the bottom of the menu structure. To move it to a different spot, simply drag and drop it somewhere else. As mentioned in the overview, the navigation has two levels: tier 1 and tier 2. Tier 1 is page-independent. In the backend, tier 1 items align flush left. Tier 2 is page-dependent. In the backend, tier 2 items are indented underneath their parent elements. 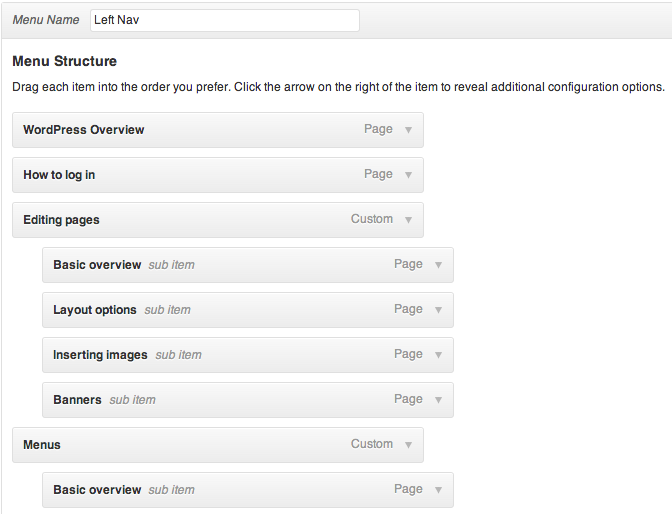 All you need to do to adjust the menu structure is drag and drop items where you would like them to appear. Note: You should not nest items below tier 2. Doing so will mess up the navigation’s spacing.